in WW2 gaming. It sparked my interest in that era and since I tested and played a couple of WW2 wargames. It had a sideeffect in me, in that I also started to get more interested in history in general, but I haven't jet tried any other historic wargames. This has all changed since we gathered a small group of friends and joined forces, one of them had a large collection of Napoleonic French and Prussian in 28 mm. As others in the group also started collecting and painting 28 mm Napeolonic and it look absolutely stunning I joined the bandwagon. I know nothing of the era, neither through the historic side or wargaming, other than there is a shitload of rules sets. 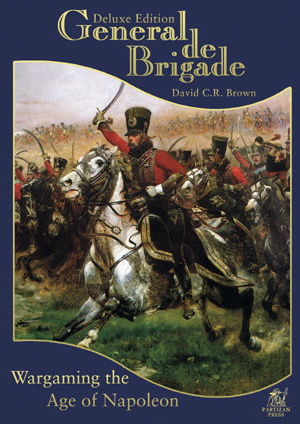 So I but my fate in those who had played it a lot, so I invested in the rulebook to General de Brigade and bought a box of Prussian landwehr from Warlord games. After some days I had painted my first Battalion and I wasn't that intimidated, so next I order enough miniatures to make two more Battalions, a Brigade officer and causalities markers. Last week I had finished the three Battalions that would make up the base for my first Brigade, this did coincide with a friend coming down from Stockholm with his wonderfully painted french troops. As it happened we also had finished the preparation for our new playing area (a basement in Lund), so with the added help from Davids Prussians (his troops made up 80 % of the Prussian forces) we hosted a small battle between Prussian and French troops. I have to say that I think it looks great, I had my doubts about playing Napelonic in 28 mm scale as I think mass battles looks better in smaller scales. But the new basement can easily host a table as big as 180x360cm, so it will probably work fine. As I am the "new kid" in Napelonic I guess I have to adapt to the once who I am playing with. Det ser riktigt mäktigt ut med så många gubbar o snygg terräng! !